I write this while it’s just a few degrees above freezing outside, pouring rain falling on melting snow. I like it. I’m happy to have it. I’m ready for the snow to leave and for spring, –or as we call it in Maine, “Mud Season”— to start. My goals for Vivian’s Last Cigarette haven’t changed or grown from last week, and my focus was on writing and editing it this weekend. I added 2,500 words to the new chapter three, reaching 3k total when I stopped on Sunday. At this point, all hell is breaking loose in the story… Viv and Gronk are running for their lives to get out of that creepy old mill, and the worst is yet to come! I should finish the chapter by the end of next weekend. I didn’t get in as much new writing as I had wanted to. My desire was to get 4,000 words done and perhaps finish the chapter. Instead, my efforts got divided between that and editing, which proved fruitful if not exactly what I’d planned. Kim did a read through of the reworked chapter one and the new chapter two. With her notes, I revised the former into to a fifth draft and the latter into its second. Then I sent them along to Lauren, who’s been the catalyst for the changes and new chapters. Lauren agreed with my gut feeling about the revised chapter one; that it’s far stronger than the third draft version and a good opener. She provided some minor notes and editing suggestions, — Lauren hates my use of interrobangs, but I keep using them like some bratty punk ;-) — but nothing major. I’ll put together a sixth draft of the first chapter soon. Lauren, who is also hard at work on her sequel to Catalyst Moon while being so kind as to beta read my work, hasn’t gotten back to me on my new second chapter yet. But I’m sure she will, and likely well before I’m done writing the third and fourth new chapters. 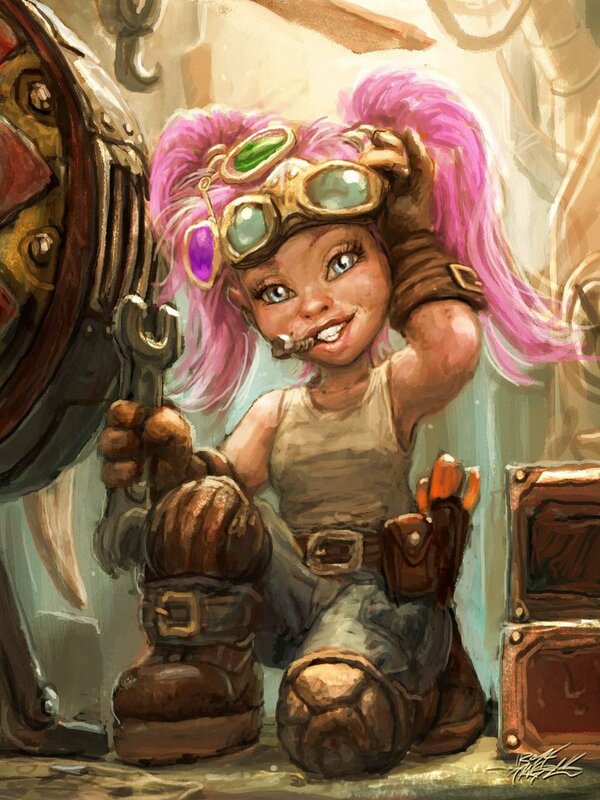 Gnome Engineering by Sacha Angel Diener. Click here for more of the artist’s work! Your Challenge this month is to write a story containing fantasy elements in a modern or 20th century style setting focused on working class, blue-collar characters. These folks may be as ordinary or exceptional as you want to write them. However, they must pay their bills with skilled or unskilled manual labor. Submissions will need to be five-thousand words or less in length to be eligible to win. This event will be open to submissions from April 24th to April 30th, with a winner being announced on May 1st. There are already a few authors saying they are excited to participate, and that’s always a good sign. I considered entering it myself. I have a fun idea for dwarven plumber in a short story (no pun intended) where he and his girlfriend are having a bit of a crisis. It would take place in the same setting and town as Vivian’s, probably even during the same summer. But I’m so busy writing and editing the book proper that it would take a minor miracle for me to find the time to finish it before the contest ends.